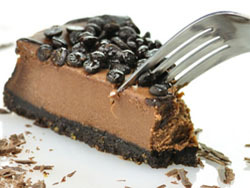 Try out some great cheesecake recipes. I usually bake in a springform pan, but for fun and if I have lots of kids around or am making a variety of desserts for the holidays, I will bake in individual tart tins or in cup cake pans. 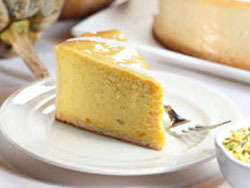 The recipes convert quite easily and the individual cakes are nice for people who just want a small bite to please their sweet tooth. Recipe credited to Connie K.
Mix together flour, sugar, lemon peel. Cut in butter to make a crumbly mixture. Add egg yolk and vanilla. Put 1/3 dough on bottom of pan. Bake 8 minutes at 400 degrees. Butter sides & put crust bottom in pan & completely cool. Put remaining dough on sides. Beat the cream cheese until fluffy, then mix in the sugar, flour and salt. Blend into the cheese mixture the eggs and milk. Beat until smooth. Pour into crust. Bake 400°F, 10 minutes. Reduce temperature to 300 degrees for 50-55 minutes. Cool 15 minutes – loosen sides. Cool 60 minutes. When cool you may add fruit topping such as a Raspberry Sauce topping or any berry pie filling spooned over the top. You can find a delicious Raspberry Sauce at Raspberry Depot - EVERYTHING Raspberry! 100's of Raspberry Recipes, Growing Information, Raspberry Nutrition and Health Benefits, and Much More at Raspberry depot! Whipped cream with Brandy blended in. Combine the graham cracker crumbs, nuts and sugar, then drizzle the melted butter over the top. Gently toss crumbs and butter until moist with butter and mixture will hold form to pan. Do not over stir into a paste. Press the crumbs onto the bottom and about two-thirds of the way up the sides of the springform pan. Cheesecake will extend above the crust. Bake for 5 minutes, then chill it in a refrigerator while you mix the filling. Combine the cream cheese and sugar in a large mixing bowl. Mix until smooth using an electric mixer removing any lumps. Reserve 1/4 cup of this mixture. Blend in the pumpkin, cinnamon, nutmeg and allspice and flour. Then add eggs one at a time. Do not over work at this point, just stir enough to blend. Continue blending and add cream and vanilla. Mixture should be smooth and creamy. Pour the filling into the prepared crust. Take the reserved mixture and swirl a design on top or pour thin lines from top to bottom, then take a knife and run it through making a wavy pattern. On the middle rack, bake at 425°F for 15 minutes, then reduce heat to 300°F and bake about 60 minutes. The cake will rise and turn a nice golden brown on top. Remove from the oven and allow to cool at room temperature. 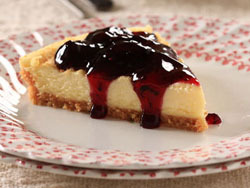 When the cheesecake has come to room temperature, put it into the refrigerator and let sit for a day before serving, keeping it in the pan until ready to serve. Release the spring and remove the sides of the pan. Cut the cake into serving size pieces and garnish with generous amounts of brandy flavored whipped cream. Dust with cinnamon. In medium size bowl, fluff the cream cheese with a mixer and slowly blend in sugar. Of all the cheesecake recipes, Mom's is truly the easiest. Try it out, the kids love it because it is light and fluffy compared to the traditional style. Crush wafers. Add melted butter and gently toss to make a crumbly mixture. Press into bottom of 9-inch springform pan. Melt butter over hot water. Add chocolate and melt over low heat. In a separate medium bowl, beat cream cheese until smooth and creamy. Add vanilla and whipping cream. Stir in the chocolate mixture. In a small bowl, beat eggs with sugar. Slowly add to chocolate mixture and beat until well blended and smooth. Pour filling into Crust and bake at 350 degrees 40 to 45 minutes or until cake puffs slightly in center. Cool and chill thoroughly before unmolding. To server, decorate with chocolate pieces, top with whipped cream or chocolate sauce. To make the chocolate sauce, very gently melt on low, 3 oz bittersweet chocolate pieces. Remove from heat and blend in 1/2 cup heavy cream and 1 tsp dark corn syrup. Whisk into a smooth sauce. Cool before pouring over the cheesecake. For a smooth cake, all ingredients should be room temperature especially the cream cheese. 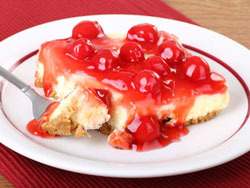 To keep cheese cake from cracking, place a pan of water under the cheesecake as it’s baking. If you use a springform pan, be sure to wrap the bottom and part way up the sides of the pan with a double layer of foil. When the cooking time is done, turn off the oven and leave the cake in the oven. Cooling too fast can make it crack. After about 15 minutes, run a knife between the edge of the pan and the cake to make sure it is released.